So now that I've told you the hows and whys, I can finally share my own seed ball experiments. My goal was to plant the summer and fall crops in the do-nothing grain area at the same time that I refreshed the clover population. For our winter grain, I opted to switch over to rye, and my new summer grains include field corn, oilseed sunflowers, amaranth, and pearl millet. 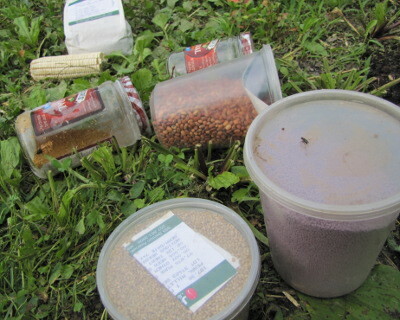 I wanted to keep each type of summer grain separate, so I made four different mixtures --- sunflower/rye/clover, amaranth/rye/clover, millet/rye/clover, and field-corn/cowpeas/rye/clover. You'll notice that the corn mixture is a little different since I added cowpeas to give this heavy feeder an extra dose of nitrogen. I also wanted to know whether seed balls are really any better than the lower work method of just mixing up the ingredients and scattering the dirt/seed mixture amid the wheat stubble. So, all told, I had eight experimental treatments --- corn/rye/clover balls, corn/rye/clover mixed into loose earth, etc. Real conclusions will have to wait a few weeks, but I already have a few observations. First, I haven't seen any wild birds chowing down on my seeds, which is a bit surprising since lots of seeds are visible on the outside of the seed balls and in the loose earth mixtures. Even more exciting, the seeds are already sprouting! Field corn may be a bit of a problem in a seed ball since the kernels are so large that they tend to fall out of the earth mixture and sit on the wheat stubble, but clover and pearl millet leaves are poking up through the dirt. I have high hopes that the other seeds will soon follow suit. 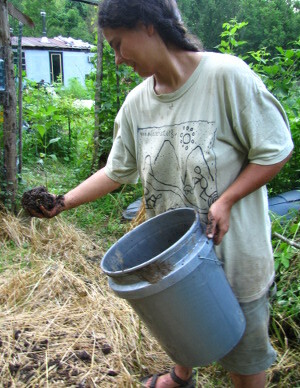 Our 99 cent Weekend Homesteader series gives you tips to get started with homesteading the easy way.